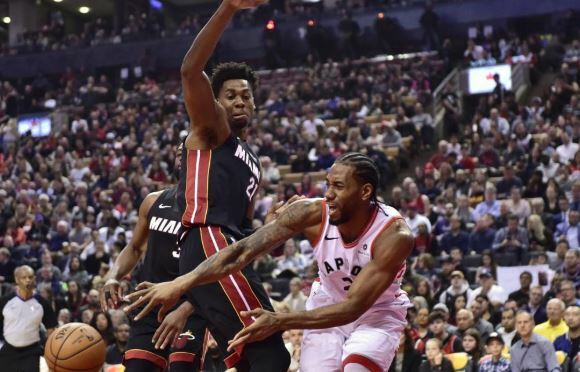 The Toronto Raptors and the Miami Heat met up at Scotiabank Arena for a rare Sunday afternoon affair. The Miami Heat are playing desperate basketball as they are embroiled in perhaps the most nail-biting playoff race in the NBA. 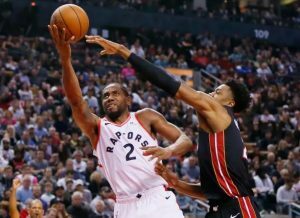 Though the Raptors are situated comfortably as the 2nd seed, the Heat currently sit on the outside looking in, meaning that this game could define the fate of their year. This was Toronto’s last home game of the regular season and likely the penultimate game of Dwyane Wade’s storied career. It certainly looked like both teams were affected by the early tip as many players were late to react and lacking some of the crispness that we are used to seeing. The Raptors came out the gate flat while the Heat carved up the paint with quick reads and timely cuts. Miami played like their backs were against the wall, they scratched and clawed with tough physicality. The Heat carried the lead for most of the game and matched Toronto’s comeback efforts shot for shot. Nothing was decided in regulation, but when the game went into overtime the tandem of Danny Green and Pascal Siakam stepped up for Toronto to finally stomp out the Heat. Toronto 117 Miami 109 in overtime. The pick up of Marc Gasol may be one of Masai Ujiri’s most shrewd moves of the season. I always knew Gasol was talented, but I never realized that he may be one of the most intelligent players in the league. His passing and playmaking skills has revitalized an already potent lineup to unparalleled levels. Gasol gave the Raptors a little bit of everything as the point-centre. He only scored 8 points but added 11 rebounds and 7 assists. Everyone’s 2K rating jumps at least two points when they play alongside the Big Orca. James Johnson was a non factor the last time these two teams met, but tonight he was given big minutes and responded with an impressive performance. Johnson is blessed with a strong body, surprising hops and crafty instincts with the ball. When he is playing well, he can make the game look incredibly easy. Today he was slicing through the paint with athletic drives and nifty moves while also knocking down big shots. James played stingy defense against Kawhi forcing the latter into some difficult attempts. Johnson paced a balanced Heat attack for 18 points, 4 rebounds, 5 assists, a steal and a block. Great game from the former Raptor. Sometimes I wonder how much opposing coaches must prepare for when they face the Raptors. The scouting report on Siakam alone could fill a novel. Not only does he have an extensive move set, he is starting to show counters and counters to his counters. All the while, Pascal’s jumper continues to improve, slowly turning him into a legitimate threat from beyond the arc. Spicy P was hot and ended the day with 23 points on an incredible 8/10 shooting to go with 10 rebounds and an assist. He came on late to lead the Raptors in overtime and he clinched the victory with a dagger from the corner much to the delight of the Toronto faithful. 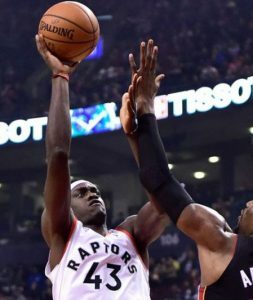 My favourite part of Pascal’s game at the moment, is the swell of excitement that comes from the crowd anytime they see Siakam leak out. Kawhi Leonard took a half to get into the game but when he did, he was efficient and effective. Leonard’s jumper is deadly in space, but when it’s taken away, he does an impressive job at muscling his way to the post where he can pull out a pump fake, spin move or soft fade. It’s amazing how easily he can influence a game with only a few minutes of elite play. The Klaw scored 22 points along with 4 rebounds, 4 assists and a steal. Leonard stepped up with some big shots late and drew much of the attention allowing guys like Green and Siakam to go off in overtime. Norm Powell seems to have won the battle against Jeremy Lin for a spot in Coach Nurse’s playoff rotation. There has been a slight uptick in his play as of late, but today Norm really broke out for an impressive performance. Norm is one of the best Raptors at attacking the rim with authority in the half court set. The Raptors needed a game like this from Powell as Kyle and Kawhi had relatively quiet nights. Norm supplemented the Raptors with explosive drives and accurate long-range shooting. Powell was perfect from the field going 7/7 (including 4 three pointers) for 23 points to go with 3 rebounds, an assist and a steal. General Powell is back in playoff form. This is our House! – The Raptors defended home court all season and ended the year with an impressive 32-9 home record. Glasswork – The Heat lost the game, but they won the battle of the boards 55-47. The Extra Frame – Toronto improves their overtime record to 5-3 for the year. Respect – Dwyane Wade exchanged jerseys with Kawhi Leonard after the game. 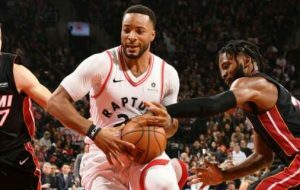 Let the Kids Play – With only one game left in the season and Toronto’s playoff position already decided, I see no reason why the Raptors should play their big guns heavy minutes. In the final game of the year, I expect the veteran core to average 20-25 min allowing the young guns to get a good run in. Toronto will look to close out the season with a win on Tuesday night against the rebuilding Timberwolves in Minnesota.